NEWBURGH, N.Y. — Students in this small city walked out of class at exactly noon, March 31, to demand immigrant rights, joining a wave of thousands of students doing the same thing in Los Angeles, San Diego, El Paso, Yakima, Wash., and scores of other cities across the nation. After leaving the school, the students assembled at a nearby church, then marched through the city carrying signs opposing the punitive anti-immigrant Sensenbrenner bill and demanding immigrant rights. Rosa Matias, a 16-year-old sophomore who participated in the walkout, said Newburgh students were inspired “after watching all the other student walkouts across the country, especially Los Angeles,” where some 40,000 students have walked out of schools over the past week. Some Southern California schools tried to interfere with the walkouts, chaining their doors and issuing truancy notices. 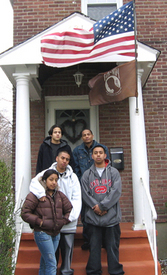 The Newburgh students faced a better situation, as many teachers, faculty and parents, both immigrant and native-born, were sympathetic. The NFA students’ exuberance contrasted starkly with a pall of fear that seemed to surround some older immigrant residents. Several Middle Eastern storeowners became nervous when conversation turned toward immigration and refused to answer questions. One said he had been advised by his brother not to talk to anyone without a lawyer present. Newburgh was a small piece of a nationwide wave of high school walkouts, sparked when 30,000 walked out March 23 in Los Angeles. The movement spread across southern California, then to places like Las Vegas, where some 4,000 students walked out last week, and Tucson, Houston and Dallas, where 16-year-old Gustavo Jimenez helped lead thousands of students in united protests. The walkout wave reached the East Coast, including J.E.B. Stuart High School in Fairfax County, Va., where dozens of students walked out, joining with hundreds from neighboring schools. The walkouts show no signs of abating. A quick search on MySpace.com, a web site popular among young people, reveals dozens more planned actions. Meanwhile on Capitol Hill, Senate Republicans maneuvered to try to weaken a measure passed by the Judiciary Committee that provides a path to citizenship for millions of undocumented immigrant workers. As senators prepared to head home for a two-week recess, immigrant rights organizations, joined by labor and religious and other groups, were readying an April 10 National Day of Action for Immigrant Justice with big demonstrations in major cities across the nation. In the House, Rep. Jose Serrano (D-N.Y.) has introduced a measure, HR 5035, that would allow judges to intervene in cases where U.S. citizen children would be harmed by deportations of undocumented parents. Jim Lane and Emile Schepers contributed to this story.